While indigenous peoples’ knowledge has historically been marginalised and not been part of the development agenda, it is nowadays widely considered crucial for development and nature conservation and has been integrated into international and national governance frameworks. Despite considerable attention to indigenous peoples and their knowledge, however, social and epistemic inequalities persist. In light of this paradox, this paper critically analyses two governance frameworks concerned with indigenous peoples’ knowledge and biodiversity: the Convention on Biological Diversity (CBD) as an international agreement and the indigenous philosophy of buen vivir as public policy manifest in Ecuador. 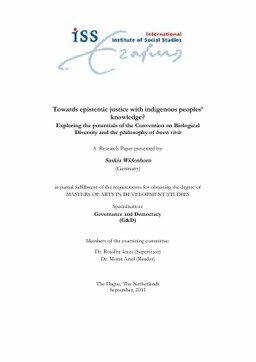 In order to understand potentials and limitations of these two governance frameworks for fostering epistemic justice, the study explores historical- political structures which have shaped them and, against this background, analyses the way in which indigenous peoples’ knowledge is represented. The analysis reveals that, in spite of its concerns with indigenous peoples’ knowledge, the approach of the CBD reproduces existing epistemic hierarchies, which undermines its potential to contribute to epistemic justice. The buen vivir, in contrast, makes visible an indigenous form of knowledge which has been marginalised by the dominant modern knowledge system. However, the translation of this indigenous philosophy into policy terms as well as its existence in parallel with other governance frameworks such as the CBD in Ecuadorian public policy currently points to obstacles that call into question the possibilities of the buen vivir to enhance epistemic justice as a governance framework. The findings show that the formal recognition of cultural diversity does not necessarily entail a promotion of epistemic diversity and social justice. These insights call for the need to question the promotion and representation of indigenous peoples’ knowledge in governance approaches as an inherently political act.